Sealed in absolutely mint untorn cellophane. Build it or display it. This is a 3 in 1 kit produced in 1985. We are not responsible for its safe return. 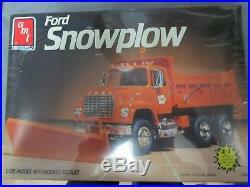 The item "AMT/Ertl #6635 Ford Snowplow. 1/25th scale" is in sale since Wednesday, October 31, 2018. This item is in the category "Toys & Hobbies\Models & Kits\Automotive\Truck". The seller is "sts7869d44" and is located in West Salem, Wisconsin. This item can be shipped worldwide.